Tonight’s topics on Hard Quiz are Meccano, Alcatraz, R.E.M. and Indonesian political history. 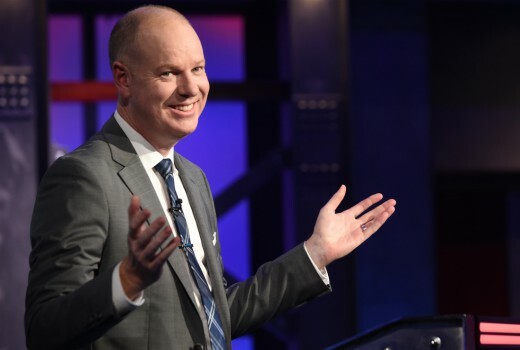 Tom Gleeson is sharpening his wit and an army of nerds and obsessives are queuing up to face him. Only those who can answer the brain-teasers and the insults will hoist the coveted Big Brass MugTM. I thought something must have occurred off camera in tonight’s show. I’m a bit slow, I only worked it out after watching a couple of replays. There is laughter and cheering from the audience. Tom stops and says to the contestants, “You have no idea what just happened, do you?” More laughter, then Tom says “Mamma mia.”. The contestants had locked in answers A, B, B, A.